SCVHistory.com LW2857 | William S. Hart | Imperial Tobacco Card, Canada, 1916. 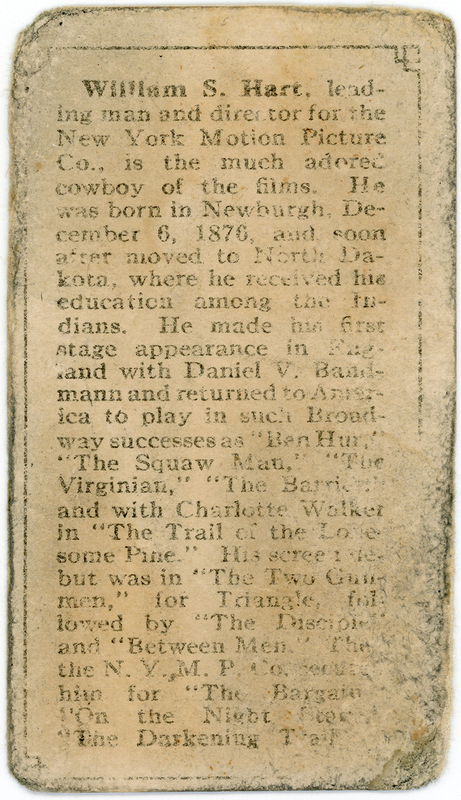 William S. Hart, leading man and director for the New York Motion Picture Co., is the much adored cowboy of the films. He was born in Newburgh, December 6, 1876 [sic], and soon after moved to North Dakota, where he received his education among the Indians. He made his first stage appearance in England with Daniel V. Bandmann and returned to America to play in such Broadway successes as "Ben Hur," "The Squaw Man," "The Virginian," "The Barrier," and with Charlotte Walker in "The Trail of the Lonesome Pine." His screen debut was in "The Two Gunmen," for Triangle, followed by "The Disciple" and "Between Men." Then the N.Y.M.P.Co. secured him for "The Bargain," "On the Night Stage," "The Darkening Trail." Hart was indeed born Dec. 6 in Newburgh, N.Y., but not in 1876. He was born in 1864. It's not a typographical error. There is speculation that either the studios or Hart himself, or both, wanted the public to think he was younger (and thus more viril?) than he was. 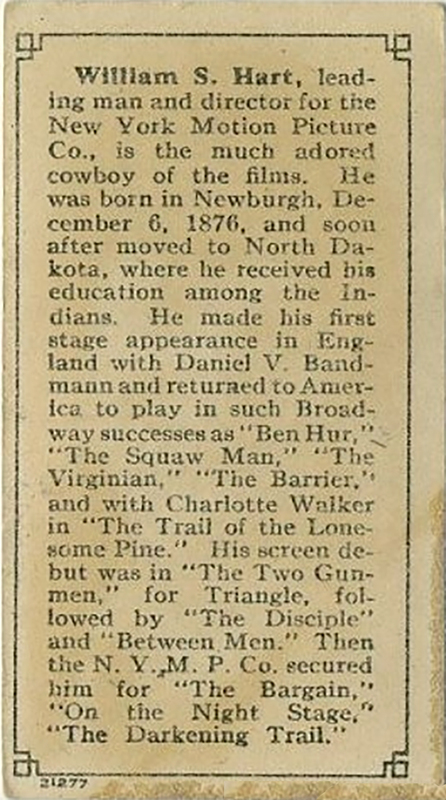 Hart was known as "the two-gun man," but he didn't appear in a film by that name (or "The Two Gunmen"). As for the rest of the films mentioned, they're all out of order with the release dates. Hart appeared in many pictures for NYMPC, but "The Disciple" was nowhere near the second. It was more like the 24th. "The Bargain" was released about 9 months earlier, not later. The New York Motion Picture Co. was formed in 1909 as a film distribution outlet by Adam Kessel, Charles Baumann and Frank Balshofer. But this was the era of block booking; the all-powerful studios had a lock on film distribution, so NYMPC's planned business model wasn't going to work. In the spirit of "If you can't beat them, join them," NYMPC almost immediately transformed into a production company. Over the next 12 years, it would release films under the brand names 101 Bison, Kay-Bee, Broncho, Domino, Reliance and Keystone Studios. It entered (and exited) joint ventures and mergers with various other production and distribution companies, most notably Mutual Film Corp. While with Mutual, Kessel and Bauman formed Keystone, which not only had Charlie Chaplin under contract in 1913-14 but also became a partner in the new, Culver City-based Triangle Film Corp. in July 1915 (after which time William S. Hart vehicles were released under the Triangle name). A major partner in Triangle was Jesse Lasky's Feature Play company, which merged into Famous Players, which became Paramount Pictures — which would become the Justice Department's sacrificial lamb when the federal government and ultimately the U.S. Supreme Court put an end to block booking many years later on grounds the practice created an unlawful monopoly. And so we come full circle. The third image in this sequence is a different example of the same card, owned by a third party. It is presented here only for legibility. 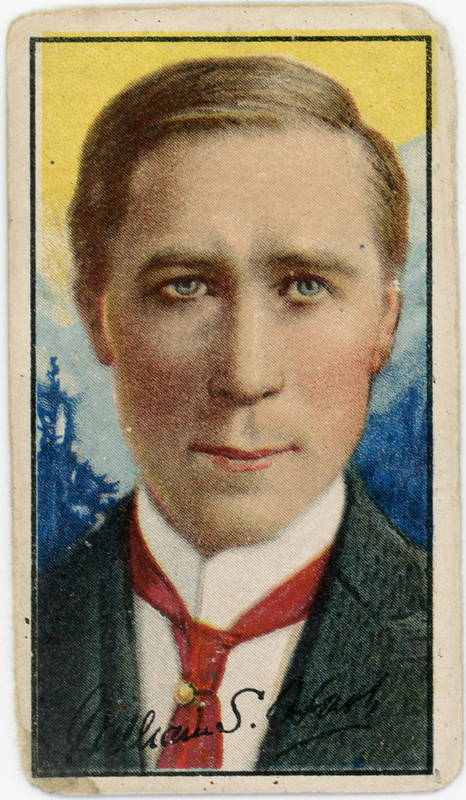 LW2857: 9600 dpi jpegs from original tobacco card purchased 2017 by Leon Worden.